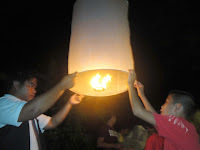 As the full moon of the twelfth lunar month (November, 10th) was about to light up the night sky, Andaman Discovery staff and volunteers from Kuraburi took the road trip to the Southern Thailand Orphanage to take part in the beautiful Thai Festival called Loy Krathong. Our five Dutch volunteers were excited about the forthcoming celebration, which pays homage to the water spirit. Arriving at the orphanage, we were greeted by the children some of them dressed in traditional Thai clothing. Two Andaman Volunteers, named by the kids as P’Nu and P’Chame were also dressed up by the home staff in traditional Thai costumes to welcome arriving guests. The night started with an introduction, given in English by the children. And although a little nerve-racking for them at times, they managed to deliver their speeches very well. While everyone was enjoying the delicious Thai food and homemade fruit punch, the night activities continued with Thai dance, performed by the girls and a Mauy Thai warm up routine, performed by the boys. After the performances an auction was held to help raise much-needed funds for the home. The children have made some beautiful paintings for which the guests had a lot of fun bidding. AD staff purchased an enchanting painting of flowers and butterflies in wonderful explosion of colours. Once the auction closed we went to choose a Krathong which is a little float made of banana leaves, adorned with flowers, candles and incense sticks. 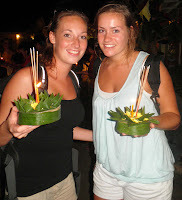 According to tradition the ritual of floating the Krathong is performed in pairs. The kids made sure we all had a partner to make a wish and send our Krathongs down the river. We had a wonderful time at the festival and thank the children and staff at the home for making this a fantastic and memorable night for everyone.